Composable jewellery is at the heart of Nomination: the Composable bracelet was the brand’s first creation and it was a true innovation in the jewellery industry. Composable contributed to the democratization of jewellery by introducing valuable stainless steel, a metal which, up until that point, wasn’t used in jewellery making. Together with stainless steel, precious details in gold were added: first came the collection of letters, followed by symbols dedicated to the most significant events. Today the collection of Composable Links includes tons of options, thus allowing you to express what you’re feeling in every moment. The accessories from the Composable Collection are a true method of communication. Each Link contains a symbol, a letter, or an inscription which lets you express your personality through your look, and which also allows you to give a special message to someone you love. Discover all our personalisable jewellery and choose the ones which best reflect you and your relationships. In addition to the precious symbols and letters included in the vast catalogue of Composable Links and Charms, you’ll also find ones dedicated to your most personal messages. In fact, the Composable Classic Collection includes engravable Links with which you can declare your love, the date of your anniversary, or your motto, for a truly unique piece of jewellery. 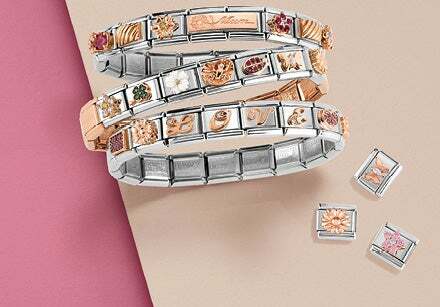 These personalisable Links containing special inscriptions are available in very precious metals: sterling silver and yellow and rose gold, to give the perfect Charm on every occasion. There are two lines dedicated to engravable Charms: Classic Links and Double Links, which offer even more space for your important words. Composable bracelets are the perfect accessory for men and women, and also for children. Our bracelets are available in various sizes and can be adapted to fit even the smallest wrists. Among the Composable Links and Charms available for personalising kid’s bracelets, you’ll find lots of adorable symbols just right for them. There are cute animal details dedicated to children, as well as symbols of their favourite sports. For a special occasion you could build a personalised bracelet with their name written in gold letters: a lovely gift to celebrate an important moment in their lives. Composable offers a myriad of solutions which make precious jewellery affordable on any budget. Surprising someone with a special gift has never been this easy: all the Links and Charms used to personalise the collections’ bracelets and necklaces start at less than €25. 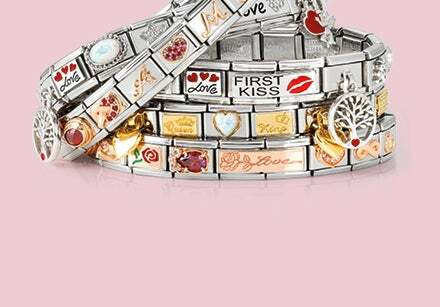 All it takes is one Charm to tell a story: a gift that says “I love you” on every occasion. Not just Charms, but ready-to-wear premade bracelets are also the perfect one-of-a-kind gift, with a wide selection of his and hers to choose from for €50 to €100.